Chattha Corporation Building Maintenance deals in building maintenance including repair maintenance of air conditioners, refrigerators and other home appliances. 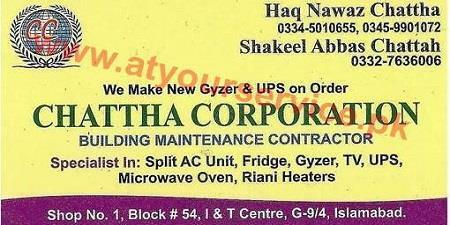 Chattha Corporation Building Maintenance is located in G 9/4, Islamabad. It deals in building maintenance including repair maintenance of air conditioners, refrigerators and other home appliances.